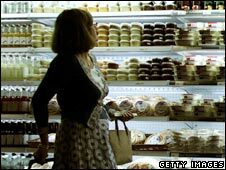 BBC NEWS | UK | Magazine | Why is a 99p price tag so attractive? Why is a 99p price tag so attractive? The tactic of shops ending prices with 99p is nothing new, but a study has found it's as effective as ever in getting shoppers to part with their cash. So why is one of the oldest tricks in the retail trade hard to resist? In terms of familiar retail ruses employed to entice shoppers to part with their money, ending price tags with 99p, rather than rounding up to the full pound, is right up there with buy one, get one free promotions and half-price offers. But according to a French study the phenomenon still swings a considerable number of shoppers. Researchers found that lowering the price of a pizza from 8.00 euros to 7.99 euros boosted sales by 15%. For consumers, the saving is minimal and the copper coins they receive as change when paying with a note seem to be more of a hassle than a benefit - in 2005, Britons discarded or stashed away £133m in unwanted coppers, according to Virgin Money. So if shoppers aren't concerned about saving mere pennies these days, why are they falling for the 99p effect? One theory is consumers just aren't up to the maths. 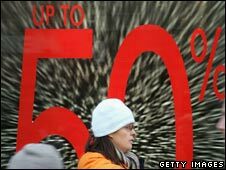 Dr Jane Price, lecturer in psychology at the University of Glamorgan, says we "tend to put numbers in categories like 'under £5' or 'under £6' - rather than them representing a value. Shoppers are aware of what is going on, but don't respond to it because they don't think logically about how close numbers are - such as £99.99 and £100." She thinks shoppers tend to focus on the big denomination - which the pound sign draws the eye to - rather than the smaller denomination: the pence. There is also the emotional incentive - people like to feel they are getting better value for money. Robert Schindler, professor of marketing at Rutgers Business School in the US, has published several papers on the "99 effect". He expresses it slightly differently, observing that people overweigh the left hand number. "When a price changes from $30 to $29.99, the change from three to two makes more of a difference than the value of that money could predict," says Mr Schindler. "It is like when a 39-year-old turns 40, the birthday feels like a big deal. Or when 1999 ends and 2000 starts. It feels like an emotional difference." It's sometimes suggested the "99 effect" was adopted as a control on employee theft - cashiers had to open the till for change, reducing the chances of them pocketing the bill. But Mr Schindler thinks it has a different origin. It was introduced for sale items, to emphasise the discount. "I studied adverts in the New York Times from 1850 - where there were no 99 endings - to the 1870s and 1880s where they started to appear. Although department stores were doing it - which would fit with the cash register hypothesis - they were advertising discounts. But for the regular price they would use a round number," he says. He thinks the retail practice developed from there, to communicate discount or the impression that things are on sale - even when they are not. But it is a subtle effect, which works when consumers are susceptible to price sensitivities and are making a snap decision, rather than deliberating over big items like cars and houses. And high end brands which exude a classy image tend not to use the tactic. Nick Gladding of Verdict Research, is sceptical shoppers are fooled by the "99p effect". However, in these more straitened times, even tiny adjustments in price can be enough to win over hard up consumers. "We are seeing fuel prices going up and down by 1p - it is a tiny amount of money, but people want to hear about it," he says. So are there any other numbers that the unsuspecting shopper should be aware of? A .95 ending is also popular, observed Mr Schindler, although anyone shopping in Asia might be struck by how prices often end in .88. The reason? Eight is an auspicious number in countries such as Japan, Hong Kong and mainland China. The only people this tactic of ending prices in 99p fools are those with brains the size of a pea. Why don't we do away with 1p and 2p pieces like they have in Australia, it makes things far simpler by ending all prices in a multiple of five? We won't have millions of pounds wasted every year as most people find 1p and 2p coins completely unusable and annoying, and leave them sitting at the bottom of the couch covers. I quite like prices ending in .99 or .95 because I store up all the 1p, 2p and 5p coins I get and then every year at Christmas I count them all and make a donation to charity. I have noticed in discount stores and the like there is now a tendency to list odd prices like £12.53. or £9.77. The impression it gives is that prices have been cut to the bone, and this seems to have psychological effect on shoppers - making them think they are getting a good deal, even if the price is actually higher than can be found elsewhere. The easy answer is to get rid of the one pence piece, after all it is rather obsolete and not really any use today. The only thing I seem to use it for now is as a screwdriver at times, but even for that a 20p piece is better.